The Securities and Exchange Commission (SEC) delegates the supervision of financial advisors to the Financial Industry Regulatory Authority (FINRA). FINRA, in return, requires us to affiliate with a broker/dealer to purchase and sell investment products on your behalf. The fact that we’ve chosen to work with Commonwealth, an independent broker/dealer–RIA, means that our firm remains independent, too. We are free to act in your best interest, helping you follow the best course of action to meet your financial goals—without any pressure to promote a particular product or strategy. It’s a model that differs from that of some other types of financial firms whose representatives are accountable not just to their clients, but also to the parent company that employs them. 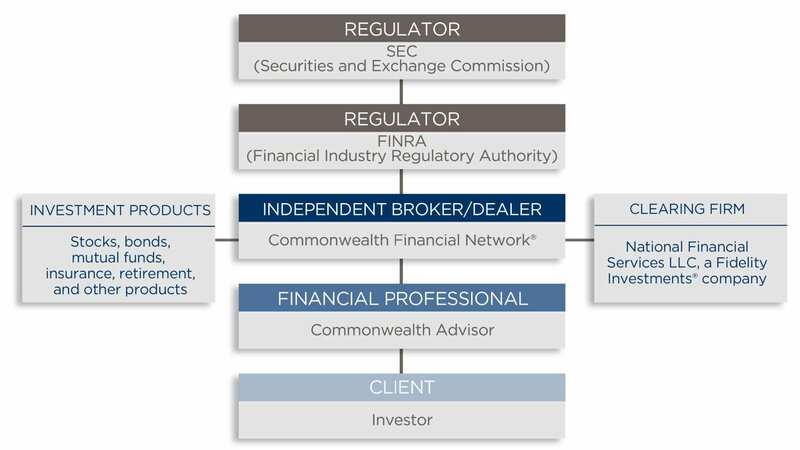 Furthermore, Commonwealth is independently owned and managed, which means the firm has the freedom to allocate resources where they’re needed and to act in the best interests of its financial advisors and their clients—not shareholders. 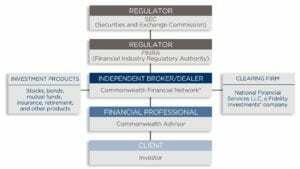 Commonwealth clears, or processes, investment transactions through National Financial Services LLC (NFS), Member NYSE/SIPC, a Fidelity Investments® company. Like Commonwealth, NFS is an industry leader with a long and stable history of customer service excellence. We have the utmost confidence in the proficiency with which NFS handles every trade, statement, report, and myriad other transactions for millions of investors every day—and we believe you can as well.